Investigating ghosts, hauntings and paranormal activity in Edmonton, Calgary, Red Deer and surrounding areas. The EPC is renown for the professionalism, dedication, integrity, and commitment that its members devote to exploring their avocation. Our primary goal is to be able to make principal and viable contributions to the fields of Parapsychology, Afterlife Research, and Paranormal Studies. However, to achieve this goal the EPC is reliant on our clients, without whom we would not have the opportunity to continue our work. ♦ There are NO charges for these services. Without clients and the opportunity to further our research, our field of study would be moot. Investigations are FREE of charge. 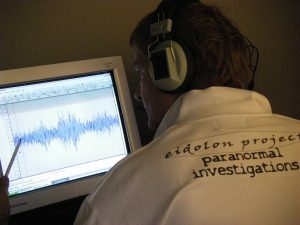 A typical investigation as executed by the Eidolon Project Canada Paranormal Investigations is carried out in stages. Please realize that these are general guidelines as no two situations are alike and variations are subject. ♦ If you feel that you are subject to a ghost or haunting, please start taking notes of the time, location and type of activity that occurred. Do not rely on memory. Also: if there are others in the household, please discuss the situation with them – not everyone may agree that they want an investigative team in. 1 – Contacting the Eidolon Project Canada. It is not the practice or policy for the EPC to solicit our services to individuals or businesses in search of a haunting, rumored or real. If people feel that there may be paranormal activity in their homes or businesses we leave the decision to seek viable and expert help up to them by contacting us. When using the contact form, please fill in all of the required areas and give us some information on the situation that prompted you to contact us. Cases, where children are involved, will take priority. If you wish to speak to a representative, please state so in the message area leave a phone number and the best time for us to contact you as you may want privacy during our conversation. NOTE: The EPC does not list our phone numbers due to the fact that in this avocation, we are occasionally contacted by people who have issues that are outside of our areas of expertise. After receiving your initial email you will be contacted by a representative of the Eidolon Project, usually via e-mail. This is done to let you know that we have received your information and are now in the process assessing your situation. You may receive further emails from our Case Coordinator to set up a convenient day and time to conduct our initial interview. ♦ IMPORTANT! Please check your spam folder if you are expecting a reply from the Eidolon Project. Due to how one has their filters employed our mail may end up in your spam/junk mail box. The EPC does not send spam or malware through our mailings. We would not have built the top of the field reputation that we have if this were the case. Our case coordinator will contact you to set up an initial interview with one or two EPC representatives at a time and location that is convenient for you. This meeting is held in a public place, such as a café. One purpose of the interview is to get additional details and more in-depth information regarding your situation. Another reason is so that both parties get to know each other. This way you can become acquainted with some of the people who will be working on your case. As noted above, you should have started taking notes by now. Please bring them with you as well as any other evidence that you may have such as photos. The interview usually takes an hour. NOTE: In cases where distance is concerned this stage will be replaced by a phone interview. After we have talked, both parties will decide if an investigation is wanted (by the potential client) or warranted (by the EPC). Should both the potential client and the EPC agree to continue with the investigation you will be given a pending case file number and become a client. 4 – Setting up the Initial Walkthrough. The walk-through is the first stage of the actual investigation. During this time one to three members will enter the site along with the client(s) to take base readings. This will include temperature, humidity, electromagnetic field readings among other tests. The client will also introduce us to the areas most affected by the activity. Depending on the lead investigators judgment, initial contact with the ghost may be attempted. This does not, as a rule, achieve any results. The main purpose is to establish a rapport with the “entity” and to let it know that we are returning in the near future to try to make contact. This prepares it so that it does not go into hiding during the Primary Investigation as well as to let it know that help is on its way. The walk-through also allows the lead investigator to determine the best places to set up our equipment for the Primary Investigation. It will also allow us to determine the best location to set up our base station (computers, monitors, lock-off camera recorder, etc.) If the client wishes, the walk-through can be conducted immediately after the Initial Meeting, or it can be postponed allowing our case coordinator to set up the best time for you to have us come in to conduct the Initial Walk-through. Your case coordinator will discuss this with you while making preparations for your case. The walk-through takes approximately one hour. After the initial walk-through, our case coordinator will start the process of arranging the investigation. This is done as quickly and efficiently as possible so that the investigation takes place at a time that is not only convenient for the client but also to arrange the Primary “Go Team”. The arrangements and scheduling may take time and your patience is more than appreciated. Once the date and time have been set, the EPC team will show up with the equipment needed for your case. Vehicles will be unloaded and the equipment brought into an area as predetermined as having little or no activity., usually close to the base station. This is done quickly, quietly and with discretion as not to alert your neighbours to your situation. Outside of the actual investigation, set up is the most time-consuming part of the operation. Tripods and other camera support devices are set up. Audio recording equipment is put in place. Meters and experimental equipment are set up. All cables are secured for the safety of all involved. Cameras have to be positioned for the best advantage of capturing possible data. Depending on the type and amount of equipment, the size of the go team and the size of the site, set up takes anywhere from one to two hours. After setting up the team will take a short break to prepare for the investigation. Giving the team a few minutes to unwind after the set up is beneficiary to the investigation and the well-being of the team. The Primary Investigation will now start. Members will be placed at the monitoring base while a team goes to one of the locations on the site that were determined to have significant activity and the investigation goes “hot”, that is the team become actively involved in doing the work that they have been trained for. Hot periods, or vigils, can last anywhere from 30 minutes to an hour. During this time recording equipment may be stopped and restarted for practicality in later Data Analysis. After a vigil is complete, the team will take a break and discuss events and any changes to our tactics that may be useful. The investigation will the go hot again, usually in a different location. This sequence will happen several times during the course of the investigation. Investigations vary in duration, usually from 6 to 10 hours. Some are held overnight, and some may require returning to a site on more than one occasion. As a rule, if the team feels that there is sufficient activity occurring to warrant staying longer, it is our practice to ride the activity out. NOTE: No two investigations are ever the same. When activity ceases the lead investigator will stop the proceedings. We have found that activity has a certain time span where things are active, and then just stop. Continuing at this stage is futile. Through years of conducting investigations we have discovered that when an entity calls it quits, the investigation should end. Take down is usually quicker than set up. The team is usually exhausted at this point, so care is taken to safely take the equipment down. It is also inventoried as it is being stored. Once the equipment is ready to go, the EPC loads and leaves as discretely as we arrived This operation can take approximately 45 minutes. ♦ Many paranormal “ghost hunter” groups will deliver “results” or “evidence” within a short time frame. However, it is the practice and policy of the Eidolon Project Canada to review data as meticulously and as intensively as humanly, and digitally, possible. The reputation of the EPC depends on the effort and time, as well as our commitment to excellence, that we dedicate to each individual case. Although there isn’t any proof that supports an existence of an afterlife, or that if there were ghosts would exist as a part of it, the EPC would be biased if we assumed that it did not exist. Therefore it is the policy of the Eidolon Project Canada to try to “rescue” any earthbound souls and allow them the opportunity to go “into the light”. The EPC will not bypass this mission. If an investigation is done, a Rescue and Cleansing Ceremony is strongly recommended. We will not leave a site haunted if we can help the deceased move on. This ceremony is also performed to remove negative energies from the site. There is no cost to the client for this service provided that a full investigation has taken place. This service is again supplied FREE of charge, provided that an investigation by the EPC has been allowed.